Here's one I made earlier . . . This is the 1 I made but don't actually like that much. It was using image I already had coloured in and lots of bits I had laying on my desk at the time - the fab scallop card made using a Cheery Lynn die set which I love as it's nice and large (this largest die is just under 6" I think and fits through cuttlebug), the green flourish leafy thing was a freebie die cut amongst 1 of my orders from Dies to Die for (where I get my Cheery Lynn dies from). 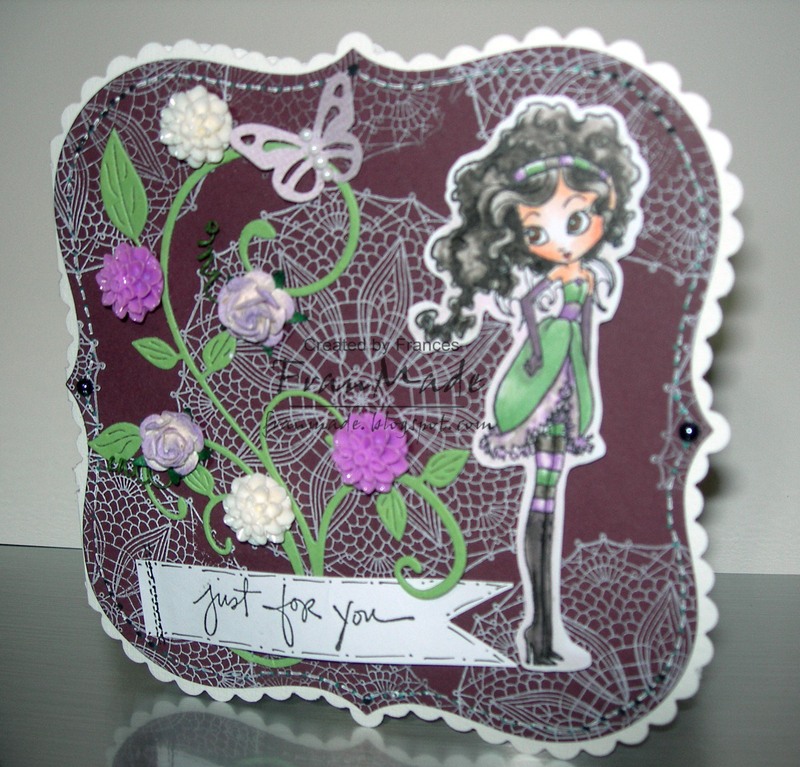 I stamped the background with a Hero arts doily stamp in white ink, added some paper roses and resin flowers (from ebay), Martha butterfly punch, some pearl gems and a bit of doodled stitching to finish. Oh, and the sentiment is from a Hero stamp set which I have hand cut into banner shape and curled onto the card by placing some foam pads behind the middle section to keep it raised. The girl is also raised on foam pads so the whole thing is very 3D in the flesh. My third card is using the other cat's pajama's stamp. Again, papers are MME and image coloured with Copics but this time the colour palette is slightly more muted as I've used a peach coloured cardbase and some kraft cardstock for the super cute film strip running down the side (I just stamped parts of the stamp onto each of the cut out sqaures and them put them back into the film strip). That along with the speech bubble is an MFT Dienamics die. I just finished it off with a bit of stitching around the edges and added some brads. 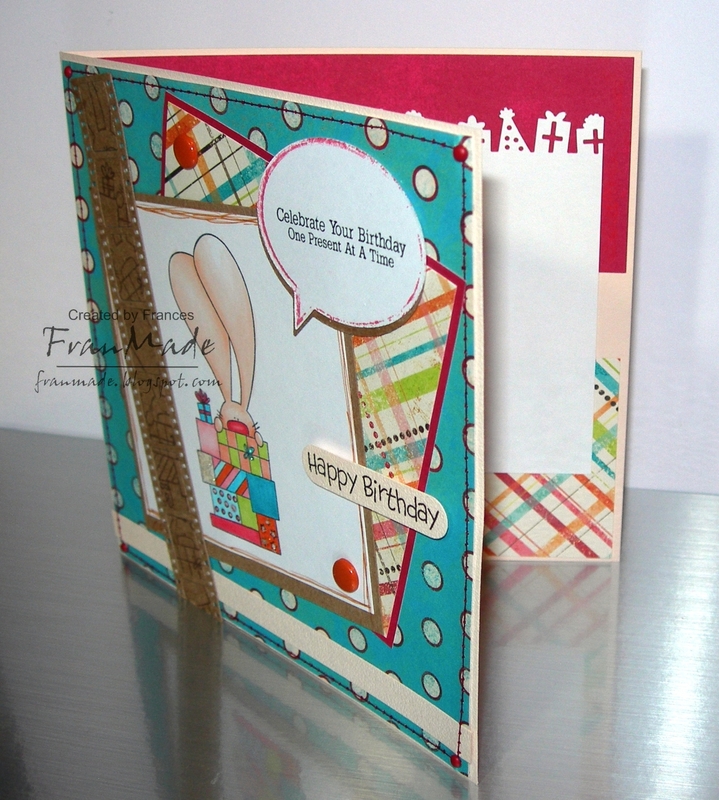 Again, the inside has been decorated using the same papers. 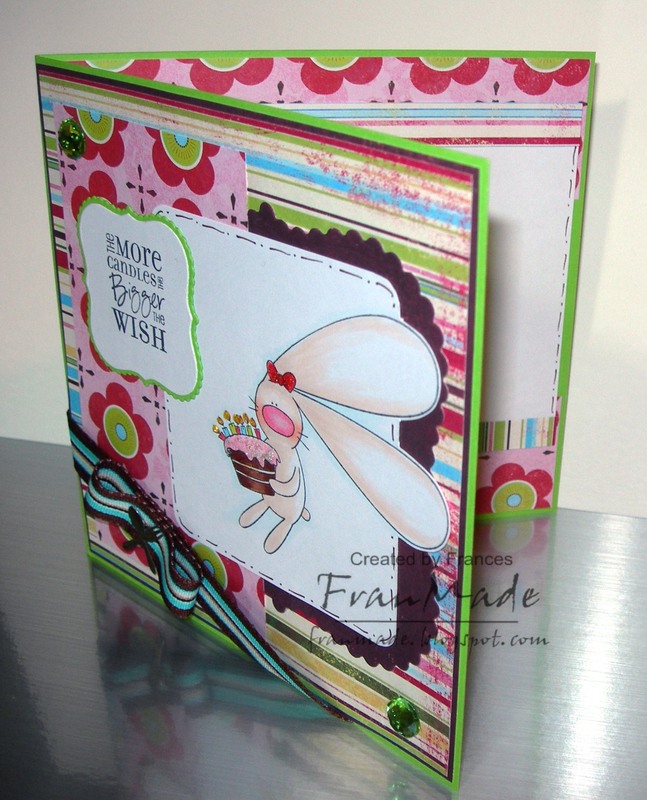 This next one is very different to my norm and is very CAS (clean & simple). The stamp is from a Papermania set of different sketched cars. 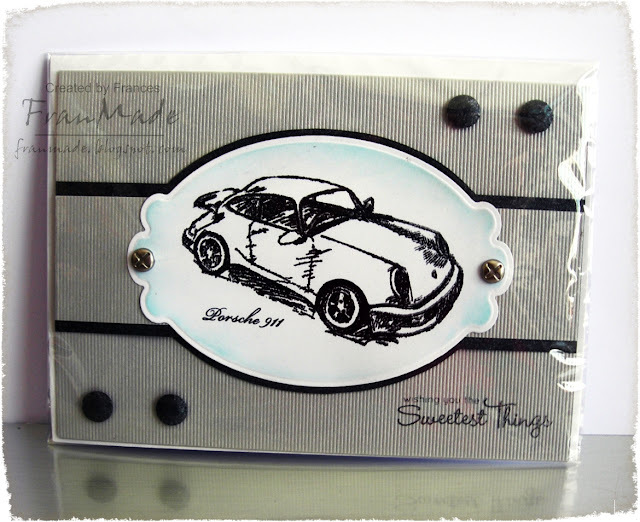 Used the Porsche for this one and just heat embossed it with a charchoal embossing powder. I know, no copic colouring!! Have inked the edges with some blue distress ink just to add a hint of colour. I used some textured grey cardstock for the cardbase and kept it really simple by just using a bit of contrast charcoal card for matting. Also used that to make some faux brads (punched out circles that I've curled with embossing tool and then stuck on with foam pads). Only other embellishment I used were couple of screw brads. Sentiment from an MFT set. Apologies for photo but I forgot to take photo until after I sealed it in the polybag! 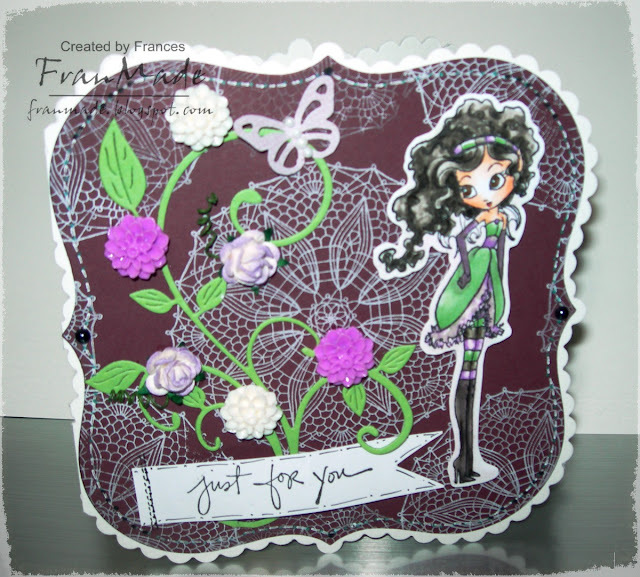 Then, finally my last card is more my usual style using a very neglected stamp - 1 of the first Gorjuss stamps that were released by Funky Kits many moons ago. Coloured with Copics, stamped some star borders around her and added bit of stickles. Papers are some more old MME papers, punched out flowers & leaves using them too (MS & EK punch). 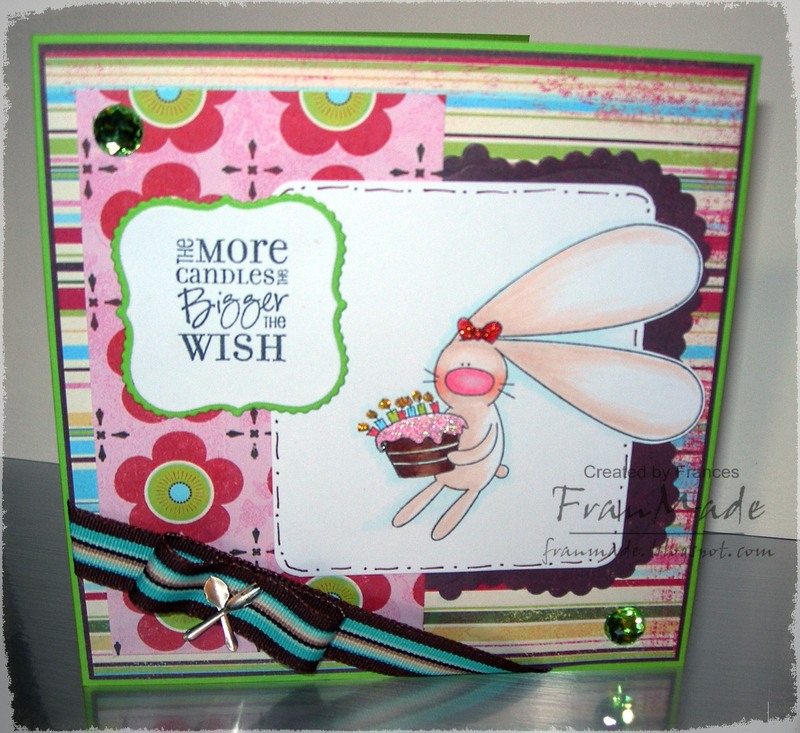 The circular sentiment is from a Whimsy mini circle set. Again used the papers to decorate the inside too and I stamped part of the image again in a lighter grey ink. Some Odd Girl - my Niece! Hello! I'm back with a card I made for my niece's 18th birthday yesterday (blimey, time flies) and I just had to use this stamp from Some Odd Girl as it just reminds me of her soooo much :) not that she's odd or that she has chunky legs LOL but just the happy-go-lucky, big-kid aspect to the image plus she is forever just in vest or T's with Jeans. Anyway, back to the card. 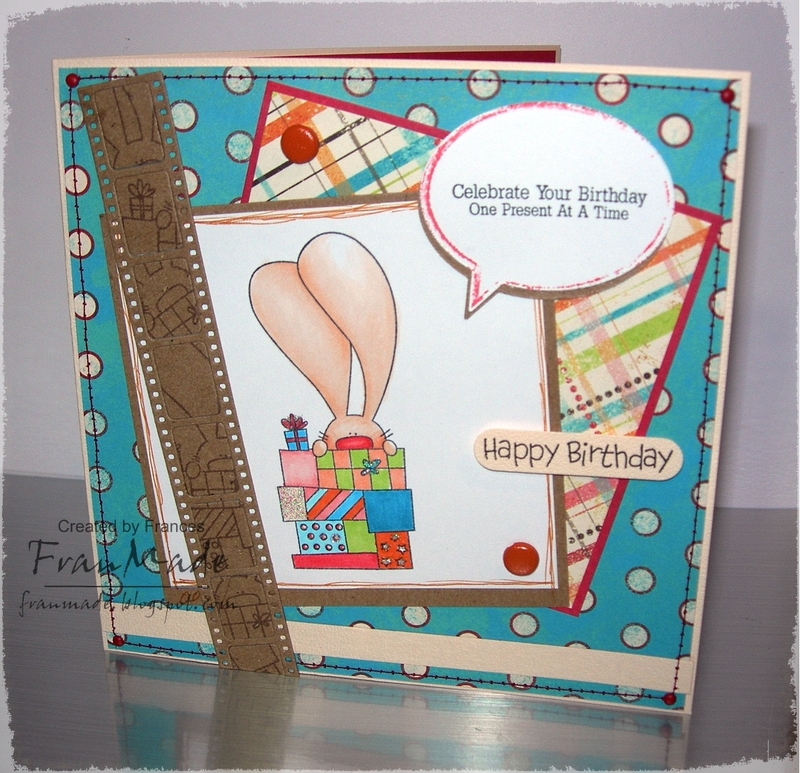 Wanted a bright cheery card and to use the fab pennant die and stamp set and something a bit more 3D but still quick to make (left it last minute as per usual!) so Easel card came to mind and then it all kinda fell into place as the bunting had to be above her head so I had to raise them on little strips of card and that just made it even cooler as they are left free to dangle behind her like real bunting. The rest were just chipboard pieces from my stash (another one of those 'things' I have that never seem to get used), and another Whimsy die & stamp set (the tickets) and voila, card done. Unfortunately as it was completed late at night and my camera battery was on it's last legs so I only managed to get 2 photos - neither of which are very good; the colour on the top one is too dark and the one below although better colour wise, still isn't great but you get the general idea I hope. 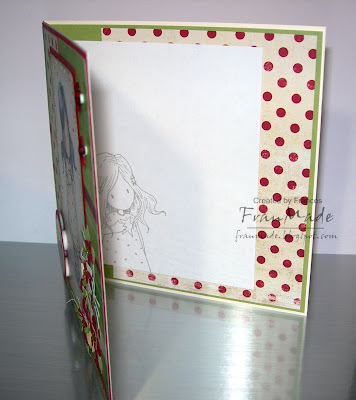 That's all from me this week, I do have another card I finished the other week but not got round to taking photo yet (probably because don't like it that much!) but will try and get that on soon. Until then hope those in the UK are enjoying this glorious sunshine that seemed to come from nowhere.